Teeth are specialized structures originating from bone, which undergo growth and replacement during early life. They are covered with the hardest substance in the human body, enamel, which has to withstand a lifetime of cutting and grinding. The four different types of teeth have different roles. 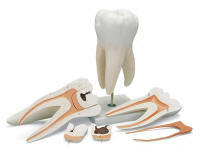 Chisel-shaped incisors cut and slice, pointed canines grip and tear and broad, flat premolars and molars crush and chew. Our anatomical models show the development of teeth, individual teeth, the teeth and jaws together and, of course, dental hygiene, which covers various diseases and the need to brush teeth properly. 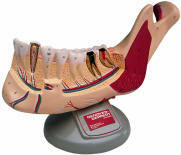 These are great patient education aids, especially helpful to dentists. 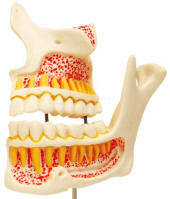 Be sure to check out our Dental Skulls and especially our Deluxe Medical Demo Skull.